Since email is the source of so much vital information, users are reluctant to delete old messages, which turns their email system into a personal email filing cabinet. 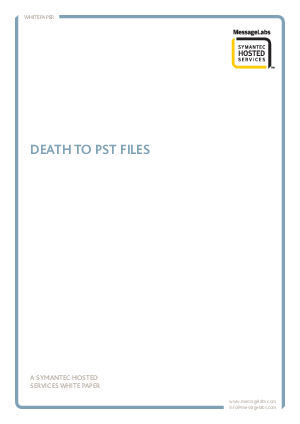 In essence, users create their own email archives using PST files. Most companies impose quotas that limit the amount of storage each person can use for emails. Without these quotas, server disk drives would overflow and email systems would crash. As email volumes grow rapidly, archiving solutions can solve a number of problems, including controlling and managing the spiraling growth of email messages; ensuring that all users adhere to corporate-communication policies; maintaining a trail of information exchanges in the event of litigation; allowing organizations to comply with government document retention regulations; and helping guard against data loss.